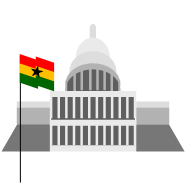 In 2014, the Ghana Government became the first African nation to join as a government member of the VPs International Initiative. As part of this membership, the Ghana Government is championing a National Action Plan which facilitates and supports the implementation of the VPs across Ghana. As representatives of local community, Local Assembly people can be the bridge to national government on issues of security and human rights, as well as voice concerns on behalf of their constituencies. Often acting as one of the key intermediaries for local grievances and conflict, local government representatives can also be important participants in local dialogues held between companies and communities. The national government can promote the VPs during their engagements withcompanies and civil society, as well as boosting VPs awareness within its own administration. The national government should continue to provide and encourage training and education for their Armed Forces and Police on the VPs, and seek formal agreements with companies to ensure deployment of public security forces in and around project areas is done so proportionately and responsibly, and in adherence to international standards. Continued facilitation and participation in dialogues on issues related to responsible security conduct by their public security forces, and the promotion of transparent investigations and impartial judicial processes for allegations of human rights abuses also remain key responsibilities of the government. As part of the membership process for national governments joining the international VPs initiative, governments must implement a National Action Plan. To learn more about the progress of the Ghana Government’s VPs National Action Plan, click here.